Last week I tweeted this..
Redundant stereotypes that hold us back. Watching the video, I was struck by this slide. In particular I was thinking about how education in NZ separates itself. Specifically how we have two separate unions for teaching professionals; the NZEI for primary and ECE, and the PPTA for secondary. Traditionally the secondary sector has seen themselves as 'specialists', while the primary sector is seen as 'generalists'. Two stories to illustrate this separation, and how it can damage how we do what we do. I was in a meeting to discuss a bullying programme that is being used in a number of schools, and we were sharing the positives and negatives of the initial trials. One of the secondary schools, deemed the anti-bullying programme to be a unit that could be taught in a specific 4 week slot. So this was done, and the work integrated as part of the PE/Health curriculum. However the bullying didn't appear to abate, and so the anti-bullying programme was deemed a failure and they were not planning to continue with it. Which to my mind shows that trying to use specialist teaching methods to address a "subject" that's a part of the human condition, is problematic. I noticed one student was sitting with an excerpt from Martin Luther King Jr's 'Letter from Birmingham Jail'. When I asked them what they thought of the text, there was a non-committal shrug. I followed this up by asking if they had ever listened to any of Dr King's speeches or oration - they said "No". I was struck by how the lack of specialist knowledge in this teaching instance was not only doing a deep disservice to the text being used, but was actively preventing the student from gaining comprehension about the text, the person who wrote it, and the world in which that person had lived. This despite the range of supposedly pedagogically sensitive and appropriately modern approaches to the learning. 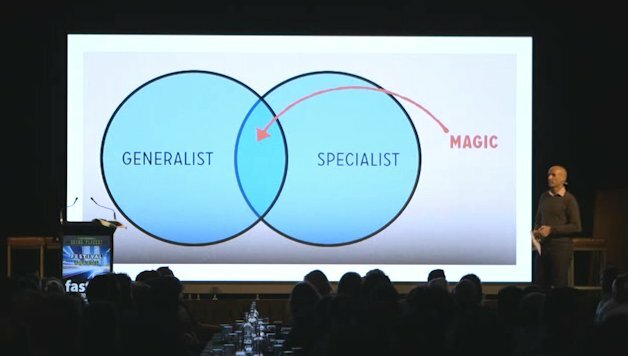 In education we need to be striving to be finding that magic sweet spot as shown on the Venn diagram above. We need to commit to being specialists, who can actively articulate the knowledge that students need to build their learning upon. If we're using Dr King, let us open student's hearts and minds to the power and timbre of his speech and his words. Let us dive deep into the knowledge and understanding of his work. We need to be open to being generalists enough to realise that not every item on our list of things to teach, can be delivered via a script. If we're discussing strategies for a societal condition that we call bullying, let's not turn it into a multi-choice quiz, tick box exercise. Let's be open to building trusting relationships with students that allow them to be honest and open about that which hurts them. Stereotypes can be useful of course. They help us define ourselves. But we need to challenge these stereotypes, rigorously and critically. We need to constantly redefine them for ourselves. So that they don't become just oversimplifications. So that they do reflect our current reality. Otherwise they do just become something we wear on a T-shirt. on making learning a pursuit that is wise and lyrical, seductive and intriguing. Something that is intrinsically human.